Full disklosure: Monster not a fan of mimes. It be a phobia me have (like heights, tight places, and Celine Dion) dat go all de way back to monster’s childhood. Me often try to figure out why dis be, and always come up wit tree possible reasons: 1. Mimes be second-cousins of clowns who, everyone can agree, be creepy mofo’s. 2. Mimes never speak clearly mean dey have someting to hide. 3. 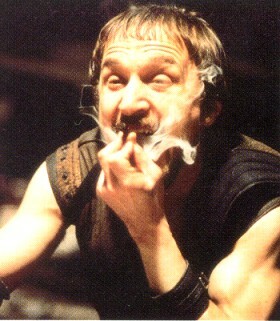 When monster just a kid, me get punched in eye by drunken mime. For dese reasons, me tink me not like mimes. Also because, for many years, street mime dat perform outside monster’s apartment building always doing invisible wall gag. It not so bad except dis particular invisible wall be bathroom stall. Anyhoo, all dis to say: me not like mimes. So when presented wit dis movie about an undead mime (! ), monster about as enthusiastic as Grover at a waxing bar. But dis movie surprise monster. In a good way. Not like sucker punch in de eye. Let’s do the time warp agaaaaiiiiin! 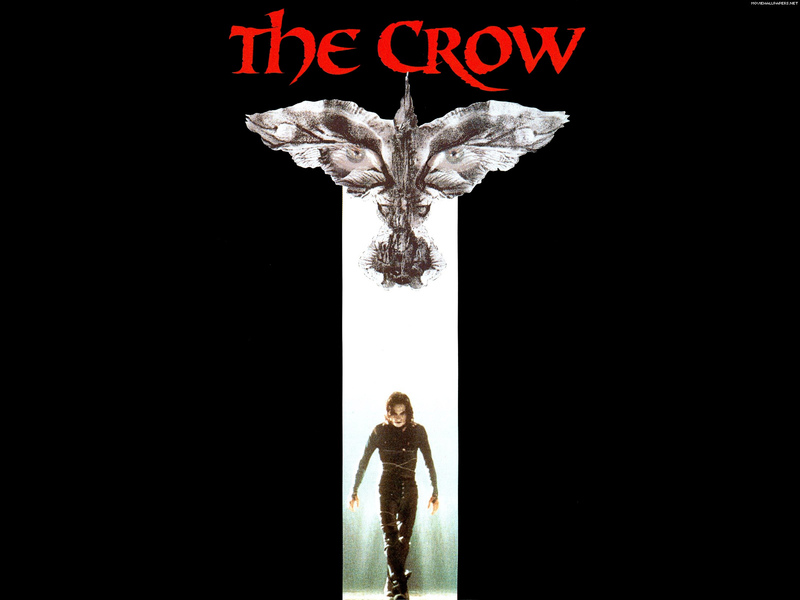 The Crow be a classic revenge tale. Boy meets Girl. Boy loses girl – and life. Boy comes back from de grave and kill a bunch of bad guys. 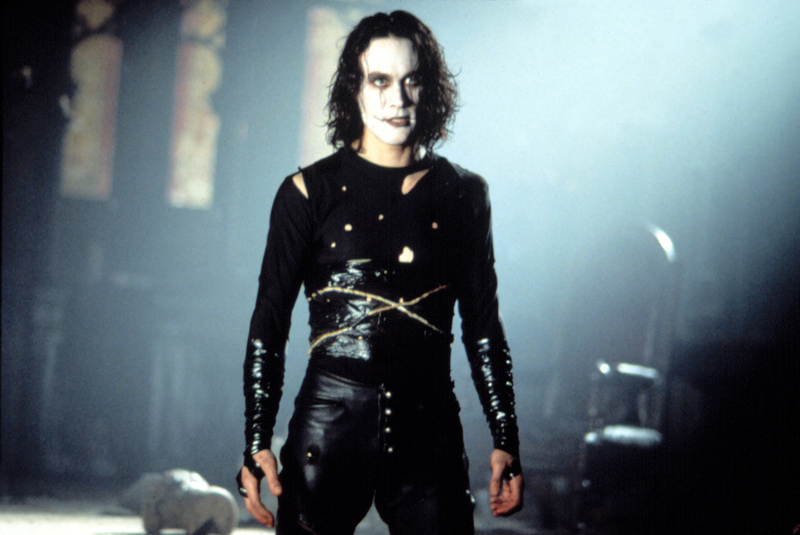 After he and his girlfriend get killed by bunch of thugs, Eric Draven take it very personal. He crawl out of his grave, don pancake make-up, and become…Super Mime. No, scratch dat. He become…De Crow! But, er, why he wear pancake make-up? He not exaktly trying to hide his identity. He tell everyone who he really be: cops, a kid, de bad guys he about to kill. It not as if police can go arrest him at his new cemetery loft. He be good at killing AND art. Drawing inspiration – and power – from a crow, Eric, aka De Crow, start exacting revenge on thugs responsible for ruining his life. One by one, he pick dem off, skewering one wit multiple knives, pincushioning another wit needles, taping another into his car before sending it speeding off a dock AND blowing it up, culminating in big shoot-out and Gothic rooftop swordfight in dead of night and driving rain! It all presented as pretty straightforward revenge fare, but it very satisfying because all de elements work. Solid direktion, a good skript dat only occasionally cheesy, and some very good performances. Movie work so well because it, at it’s heart, be a story about love and loss. De Crow not be your typical vigilante but a tragik figure. Dis conveyed in his backstory, his love for his girlfriend, in brilliantly broody performance by Brandon Lee, and in his relationships wit two secondary characters: a by-de-book cop and a street kid wit a chip on her shoulder. On de surface, de latter seem as cliched as de movie’s plot but, like de plot, it transcend formula and stereotypes to deliver a film wit surprising heart and depth. Verdikt: Puts almost every other bloated, big budget superhero movie to shame. Rating: 8.5 chocolate chippee cookies!